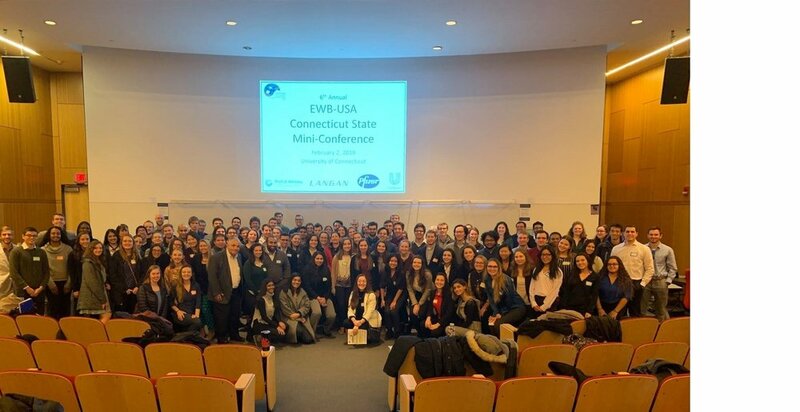 On February 2nd we hosted our 6th annual CT-State EWB-USA Conference at the University of Connecticut. We were honored to have 120 volunteers from 20 Chapters across 6 states participate in our interactive event this year! Attendees enjoyed the opportunity to network with other chapters and to learn from a lineup of impressive speakers, including members from EWB-USA HQ and the EWB-USA Board of Directors. Thank you to Pratt & Whitney, Langan, Pfizer, and Unilever for sponsoring our event! At this year's EWB-USA National Conference in San Francisco, our chapter was selected as EWB-USA’s Premier Professional Chapter for 2018! We are grateful for the recognition of our work from EWB-USA HQ and are excited to continue our work with the launch of our new Tanzania project. Click here to read about how we used our engineering systems and design-based knowledge to build a solar-powered pipeline to move drinking water up a mountainside in rural Nepal. The resulting project, completed in 2017, gave the village of Sabhung’s 800 residents easier, safer access to drinking water. Humanity today faces enormous global Challenges. Billions of people living around the world lack access to clean water, electricity and adequate hygiene and sanitation. Our vision is a world in which the communities we serve have the capacity to sustainably meet their basic human needs. Our members are dedicated to enriching global perspectives through the innovative professional educational opportunities that the EWB-USA program provides. View our feature-length documentary "Bringing Water to Ward 8" above or navigate to the Sabhung, Nepal project page to learn more about our recently closed-out water supply project. We're actively involved in improving our global community, but we make it a point to contribute to our local community, as well. Ready to align yourself with our cause? You can become a contributor to our mission, or participate yourself! Sign up with your email address so we can keep you posted on our story and efforts!